The traditional opening day of trout season is this coming Saturday, March 30. Anticipation is always high for any opening day, and Maryland’s put-and-take trout fishermen will be out all across the state. The daffodils and forsythia are blooming, but we are still waiting for that nice stretch of spring weather to arrive and warm our favorite fishing waters. After a warmer Friday and Saturday, we will have cool day and night air temperatures that won’t greatly increase water temperatures over the next week. Expect windy conditions on Thursday night; Sunday will be windy with a chance of rain. 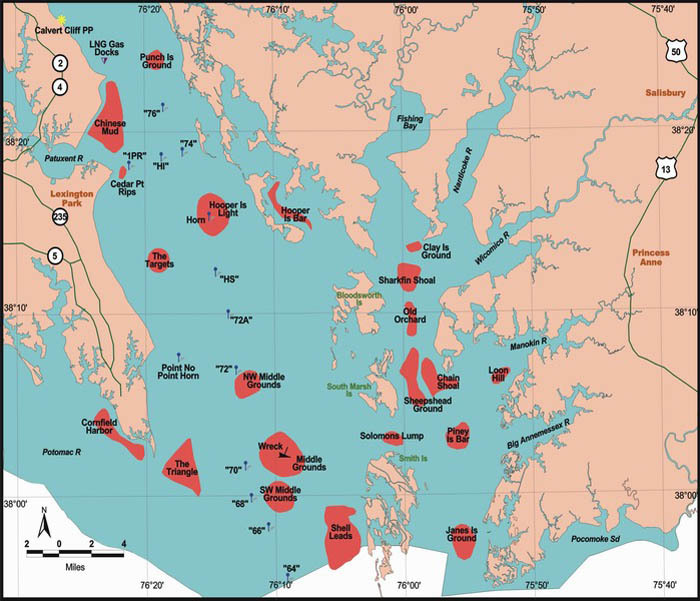 The Maryland portion of the Chesapeake Bay continues to have suitable oxygen conditions from surface to bottom. Bay salinities are still below average from the continued high rainfall. Recent Maryland Department of Natural Resources monitoring shows surface water temperatures are holding around the mid to upper 40s with some tributaries slightly warmer. The coolest water is in the upper bay, as a result of the recent rains in the Susquehanna River watershed. Water temperature at the National Oceanic and Atmospheric Administration buoy at Point Lookout is holding in the mid to upper 40s while the buoy at the Gooses is slightly cooler, holding in the mid-40s. Shallow, dark bottomed rivers and streams and downwind areas will warm faster on a sunny day and will often hold water temperatures at or slightly above 50 degrees. In addition, there are still slightly warmer bottom waters so anglers may want to scan these deeper, main bay areas for fish. Expect reduced but improving water clarity on the Potomac River downstream to near Quantico as a result of the recent rainfall. 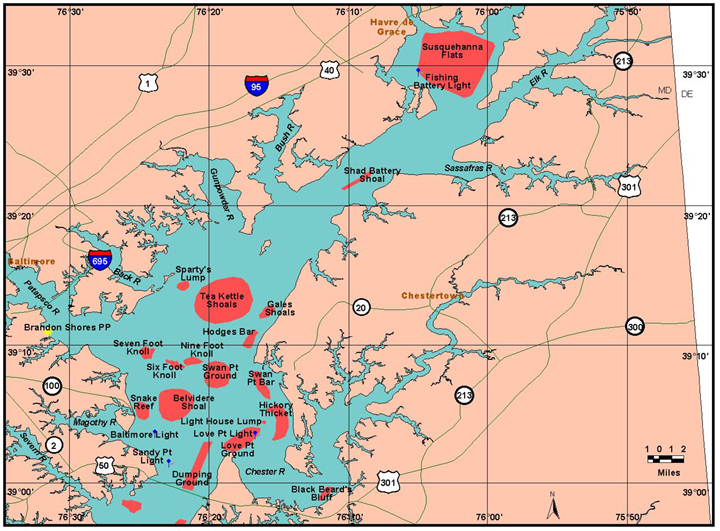 In the upper bay, reduced water clarity will continue down to Pooles Island, along east side, as a result of Conowingo Dam spilling water. Expect normal flows for the Potomac River and smaller rivers and streams entering Maryland’s portion of the bay. There will be above average tidal currents on Monday and Tuesday as a result of the upcoming new moon April 5. Most of the fishing action centers around the spawning runs of white perch in the tributary creeks and rivers. Most have recovered from last week’s heavy rain with water temperatures and clarity returning to acceptable conditions. The Bohemia, Bush, Chester, Gunpowder, Magothy, Northeast, and Sassafras are just a few of the rivers where spawning white perch can be found. Water temperatures in the upper regions of these rivers are in the upper 40s setting the stage for spawning. Small soft plastic jigs and small spinnerbaits work well and the standard small jig head tipped with a grass shrimp, piece of bloodworm or a small minnow are the best ways to fish for them. If fishing from shore, casting slightly upstream and allowing it to sink to the bottom and then lightly jigging will put you in the strike zone. Targeting the deeper holes or sections of the upper waters usually holds the best chances for congregated perch. The lower Susquehanna River is running cold and stained this week as several gates have been open at the Conowingo Dam. Prior to last week’s rain event, anglers were catching and releasing a few small male striped bass in the river and the Susquehanna Flats area. There will be plenty of opportunities for catching a mix of channel, flathead and blue catfish in the river close to the dam as flows calm down. Spawning runs of white perch in the middle bay tributaries tend to be driving most of the fishing action this week. 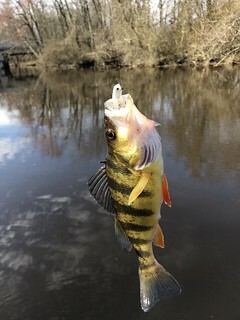 In the upper Tuckahoe River, the white perch action started in earnest this past weekend and continues with large numbers of fish available to anglers. Water temperatures are close to 50 degrees during the mid-day hours and all one needs is a good falling tide. Anglers will also encounter post-spawn yellow perch, which are an added bonus. 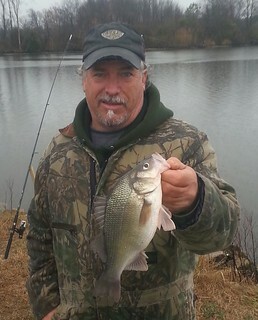 Angler will see similar fishing for white perch in the Choptank and Severn rivers. Most of the white perch tend to be in the 5-inch to 7-inch size range with a percentage in the 8-inch to 11-inch range. Small jig heads tipped with grass shrimp or pieces of bloodworm or minnow have been popular lures, as is a simple hook with a split shot baited with minnows, bloodworm or grass shrimp. Those fishing in the Tuckahoe and Choptank rivers with small jigs began to see blueback herring and hickory shad taking their jigs this past weekend. Both species can provide some fun catch-and-release fishing on light tackle, but must be released unharmed. The hickory shad run in the Choptank River near Red Bridges is a much anticipated event and will start in earnest in about a week. Choptank River area anglers should note that the Martinak State Park boat ramp and associated parking lot will be closed for improvements on March 28 and again from April 1-5. Large female striped bass are moving into the middle bay region and heading up the Choptank River in preparation of spawning in the next couple of weeks. The warm water discharge pipe at the Calvert Cliffs Power Plant is quickly becoming a go-to place to try some jigging action for large striped bass that tend to pause there for a little warmth. Other striped bass catch-and-release fishermen are trying some trolling along the steep channel edges and jigging along channel edges. The Dorchester County of Bill Burton Fishing Pier State Park has reopened for day-use only from 7 a.m. to sunset. The Talbot County side, which closes every winter, is scheduled to reopen for day-use access on April 1. Fishing for spawning runs of white perch has been a popular pastime in the tidal rivers. The Nanticoke River near and including Marshyhope Creek has been a great place to catch them, as have the upper Wicomico and Pocomoke rivers. The upper Patuxent River and several of the creeks that flow into it, along with some of the tributaries of the Potomac River, have good spawning runs. Fishing for blue catfish has been excellent in the Nanticoke River below Sharptown, as well as the Patuxent River and the Potomac River near Fort Washington. Fresh cut baits of gizzard shad are one of the best and more common baits used, but white perch are plentiful, make good bait and are easily caught in the same areas that the blue catfish are found. 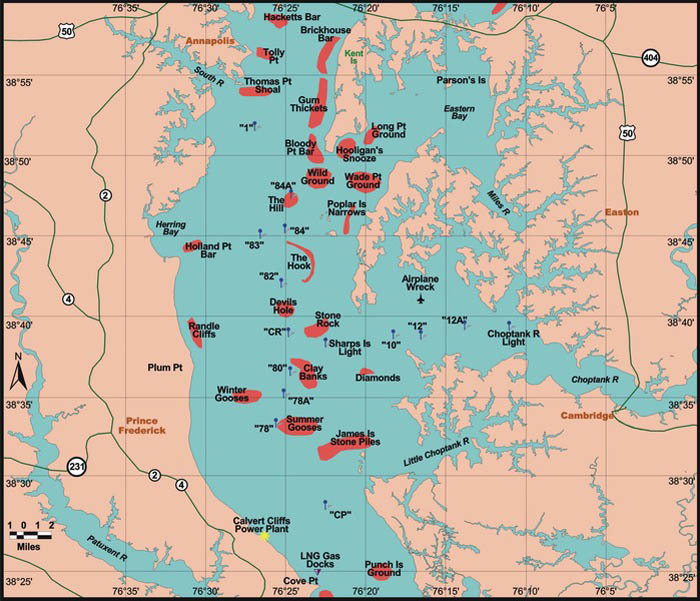 Large striped bass are moving through the lower bay region on their way to the spawning areas of the Potomac, Patuxent and Nanticoke rivers and are passing through on their way to the Choptank River and upper bay spawning sites. The fish tend to be moving along the steeper channel edges using the swifter currents to their advantage, and with water temperatures a bit chilly they tend to be closer to the warmer surface waters. Those trolling with planer boards have a shot at some fun catch and release fishing. Others have been jigging over medium-sized striped bass they spot along channel edges with their depth finders. 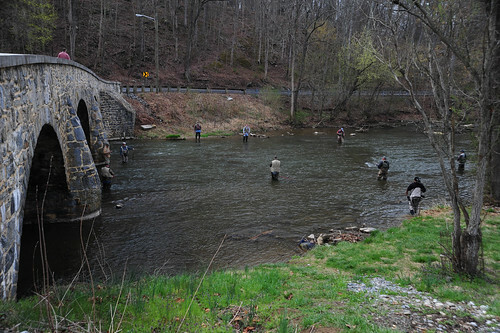 For trout fishermen all over Maryland, this Saturday will be the traditional opening day with all waters that are designated as put-and-take open to trout fishing. Crews have been working hard to get trout stocked this week at your favorite location – many will spend a sleepless Friday night. A big thanks go to the department’s hatchery and stocking operations. Excellent water flows have been a blessing for our trout program. More than 80,000 fish will have been stocked between March 11 and March 29. These fish are averaging around 1.65 fish per pound statewide. Included in that number, nearly 2,600 holdover and trophy fish averaging 1.5 pounds – and as much as 6 pounds — will have been stocked and don’t be surprised if there aren’t a few that tip the scales over 10 pounds. There will be a few trout stocking changes this spring. The Avalon Pond/Lost Lake in Patapsco Valley State Park cannot be stocked with put-and-take trout due to flood damage and storm debris. 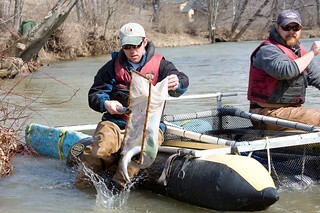 The allocation of trout will be stocked in the Avalon area of the Patapsco River. Laurel Lake cannot be stocked with put-and-take trout due to ongoing dam maintenance; its allocation will be stocked in the nearby Patuxent River. The upper Potomac River is still running strong, but fishable for those with suitable boats and river experience. Smallmouth bass, walleye and muskie have been active and fishermen have been doing well when river conditions allow. Walleye have spawned and will begin to distribute throughout the river as they move away from spawning areas. Crankbaits are a great tool for searching for walleye under post spawn conditions. At Deep Creek Lake, yellow perch and walleye are being found along steep rocky shoreline areas. Fishing with minnows under a slip bobber or drifting minnows in deeper waters has been a popular way to catch them. Casting crankbaits and jerkbaits in the evening hours along steep rocky edges is also a fun way to catch walleye. Chain pickerel are active along shorelines and cove areas and northern pike are being caught near the entrances of coves. Fishing for crappie has been good in the tidal and nontidal waters of the state. The crappie most often can be found somewhat deep near structure. Marina docks, piers, sunken wood and fallen treetops are great places to look for them. Small jigs or minnows worked slowly or under a bobber are great ways to fish for them. Fishing for northern snakeheads is quickly picking up as water temperatures warm up. Most are having the best success with fishing large minnows under a bobber along deeper shoreline areas. 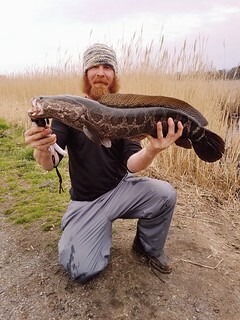 The Eastern Shore rivers and tributaries to the tidal Patuxent and Potomac rivers offer plenty of exciting snakehead fishing. Largemouth bass are becoming more active as waters warm up and their interests in feeding increase. Casting a variety of soft plastics near structure such as sunken wood in transition areas between shallow and deep waters is a great tactic. Jigs and crankbaits are also a good option in these areas. Spinnerbaits are a great way to cover a lot of water in these transition areas. Tautog fishing at the offshore wreck and reef sites continues to be the most popular fishing out of Ocean City. Success is often governed by a good running tide and water temperatures that might be a little warmer. Green crabs and Jonah crabs are the preferred baits. As warmer and calmer weather slips in now and then and more boats are launched or arrive from southern ports, deep-drop fishing for tilefish will become more of an option for fishing. The warmer weather will also bring out surf fishermen who wish to enjoy some time on the beaches of Ocean City or Assateague. A few short striped bass will no doubt be caught and there is always the hope of a northbound large striped bass moving in close to the beaches. There has been some catch-and-release striped bass action being reported in the coastal bay near the Route 90 Bridge. Jigging with bucktails and soft plastics has been the most popular way to fish. 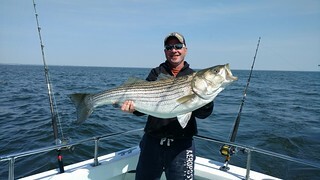 Maryland Fishing Report is written and compiled by Keith Lockwood, Maryland Department of Natural Resources fisheries biologist. Click Before You Cast is written by Tidewater Ecosystem Assessment Director Tom Parham.